IGUANA goal is to solve all event display needs of CMS for online and offline monitoring, debugging, simulation, reconstruction, and analysis. Make it trivial to use with a professional quality interface design, possibility to use one command, and wizards to help with configurations and data fetching. Also for developers: easy to extend the functionality. Make it available to all collaborators: e.g. well packaged (together with CMSSW) and Web client to avoid local installations. 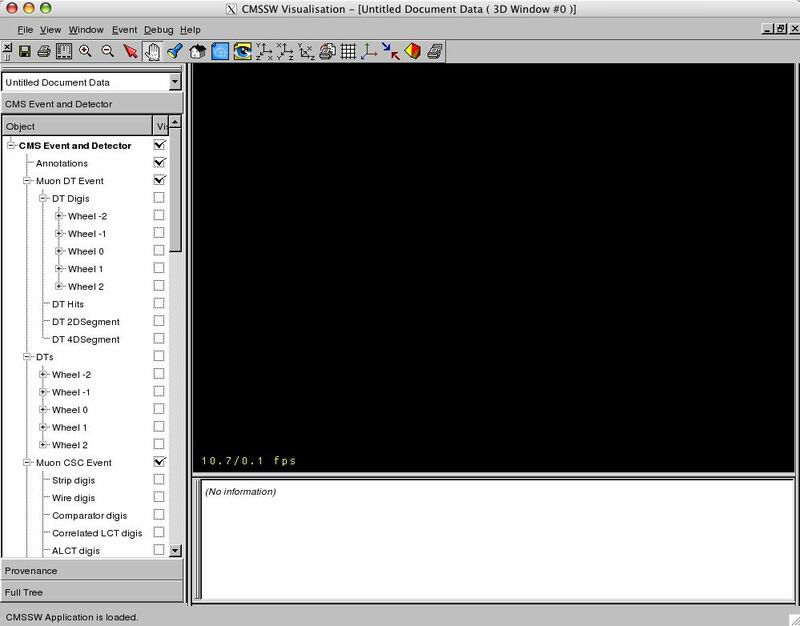 The basic idea behind IGUANA is that an application is configured at run-time from iglets (a.k.a. plugins). 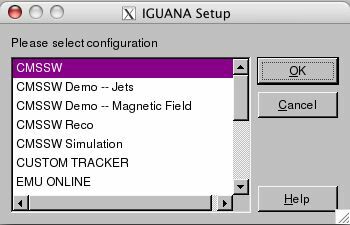 Say, a user wants to display Tracks, (s)he tells IGUANA (in the configuration file) to load the iglet which knows how to display Tracks. The iglets group a set of twigs (a class which knows how to display a type of a data collection). 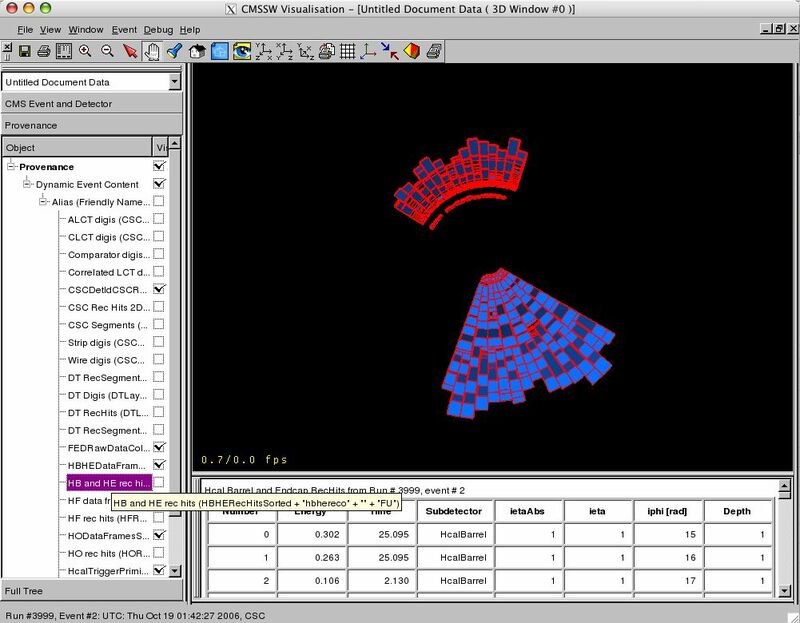 For example, the CSC iglet contains all related to CSC data twigs, such as a VisCSCStripDigiTwig class which displays CSCStripDigi , etc. 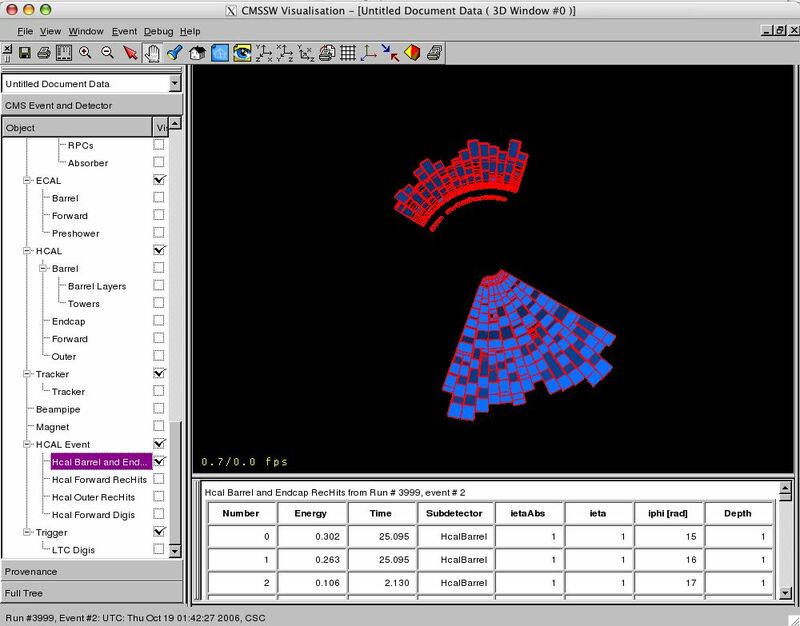 IGUANACMS - Interactive Graphics and User ANAlysis for CMS - a SCRAM-based project for CMS specific visualization based on ORCA and OSCAR. 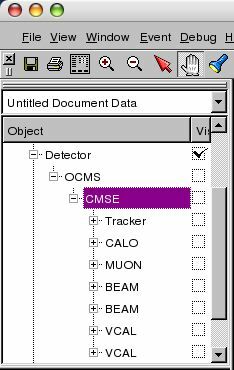 The IGUANACMS code has been migrated to the new Event Data Model and is now part of the CMSSW project. IGUANA - Interactive Graphics for User ANAlysis - in development since 1999. First public presentation during CHEP 2000. Developed by George Alverson, Giulio Eulisse, Ianna Osborne, Shahzad Muzaffar, Lassi Tuura, and Lucas Taylor. 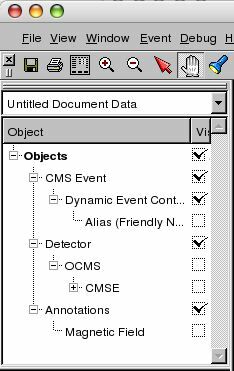 The default event display tree for displaying both CMS event data and geometry is large. The dynamic event content is even larger. 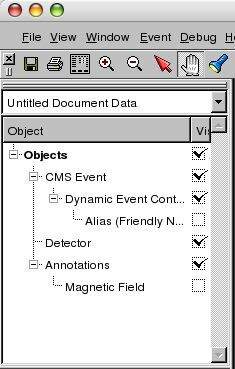 The proposed feature separates the first from the latter in two different tree browsers: "CMS Event and Detector" and "Provenance". The text browser is moved to the bottom docking area to allow better visibility of the tables it usually displays. 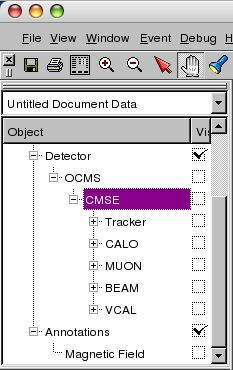 The "CMS Event and Detector" tree is open by default. To open another tree the user clicks on the tree title, for example, "Provenance". See the snapshots attached. This picture shows "Provenance tree": The former actions to enable and expand it are not needed. 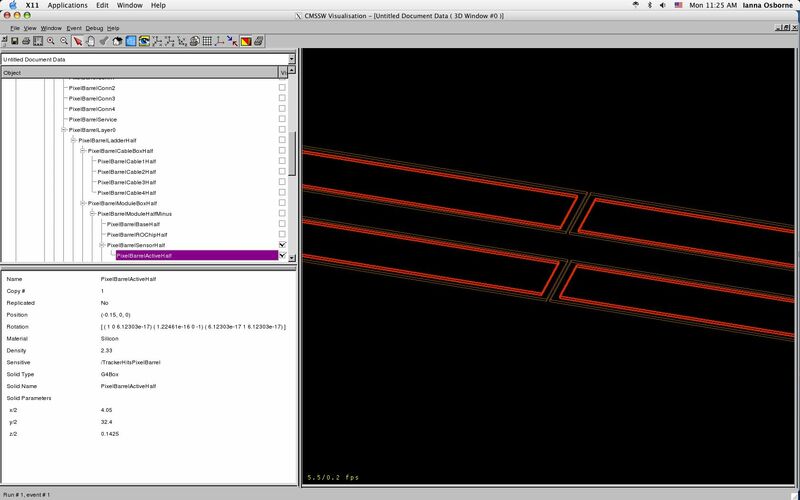 The GsfTracks are sown in magenta. An ideal helix is drawn from an innermost and an outermost positions based on the corresponding directions. The printout of the GsfTracks is shown beneath. The Track tracks are shown in blue. The reconstructed tracks (Track and GsfTrack) should be selected from the "Event data Collections" browser. See How to explore Event Content tutorial for more information. "Show all Tracks" option has been disabled due to another problem related to a difference between asking for all the tracks with getManyByType and asking for a specific collection with getMany. 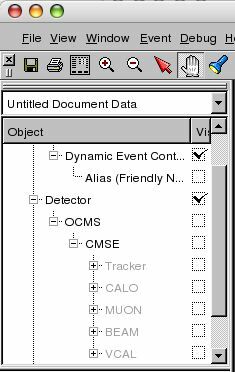 As a consequence, the "Tracker event"->"Rec Tracks" branch in "CMS Event and Detector" will not display all reconstructed (Track) tracks. 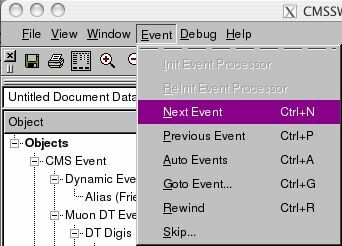 The individual collections should be selected from the "Event data Collections" browser. NURB (NonUniform Rational B-spline) A type of b-spline that is very flexible. NURB curves can represent any shape from a straight line to a circle or ellipse with very little data. They can also be used for guiding animation paths, for approximating data and for controlling the shapes of 3D surfaces. NURBs are known for their ability to control the smoothness of a curve. Spline In computer graphics, a smooth curve that runs through a series of given points. The term is often used to refer to any curve, because long before computers, a spline was a flat, pliable strip of wood or metal that was bent into a desired shape for drawing curves on paper. B-spline In computer graphics, a curve that is generated using a mathematical formula that assures continuity with other b-splines.